As some of you know, we recently shipped TeamCity 6 which includes, out of the box, a bundled version of dotCover. What this means is that you can now get free coverage for your code easily, and of course even if you’re using the Professional version of TeamCity. The setup is quite easy if you are using MSTest and NUnit. For MSpec, you need to take a few additional steps. Normally build files consist of a series of tasks that involve compilation and running of tests. With TeamCity, you can separate some of these steps out into individual TeamCity Build steps, which is what we will be doing in this case (everything that we see here applies to both MSTest and NUnit). As we can see, other than compiling a solution, which in this case consists of the actual application and the test assemblies, not much else going on. [Note: this could have been done using the SLN as the Runner Type under TeamCity since this example build script does not do much else. In real scenarios however, build scripts do more than just call a solution (in fact normally you’d call projects not solutions)]. Notice that all we are doing here is calling our MSBuild script. No coverage settings yet. (the sections cut out are blank). 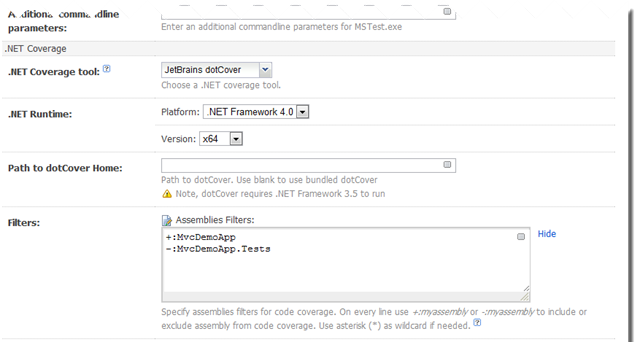 In the .NET Coverage tool section we select JetBrains dotCover and then add the assemblies we want coverage for (just the name of the assembly) prefixing them with +: and filtering out those we do not want coverage for with –:. That’s all there is to it. Once we run the Build, we should now see a new tab with Coverage Reports as well as a new Artifact which contains the Coverage files zipped up. What about MSpec or my Specific Test Runner? If we are using MSpec or a different test runner that is not supported directly by TeamCity, we can still get coverage reports; we just need to do a little bit of additional configuration. TeamCity has an API which allows us to send it messages when we want to interact with it (this is actually quite a powerful feature but out of scope for this post so please leave a comment if you’d like me to cover it in more detail). We can leverage this API to tell it when to start coverage and where to get the results from. 2. The second <Exec> is the one that runs dotCover. This uses a configuration file called dotCover.xml which we will examine further down. We pass in the c (or coverage) option when calling dotCover. 3. This is a message we send to TeamCity to tell it that we have run coverage. We indicate the tool we are using (dotcover in this case) and where the results are located. TeamCity uses this information to then display the results in the UI. This is one of the API messages mentioned earlier. We can see that running code coverage is now pretty straightforward when using MSTest, NUnit or even a custom test runner. Most of what we have covered for MSpec will work with pretty much any test runner in terms of coverage (feel free to vote here for MSpec support). With any build process, there are numerous ways of doing the same thing. I’m going to show you one of them. Based on your setup and needs you might want to do things differently. Fortunately TeamCity is flexible enough to allow for many scenarios. One thing to be aware of is that dotCover creates some temporary files for the XmlSerailizer in the Temp profile folder. This normally is not a problem unless the folder does not exist. If you are running TeamCity under the SYSTEM account, make sure that the folder C:Windowssystem32configsystemprofileAppDataLocalTemp exists. This will probably change in future versions so to avoid any possible issues. 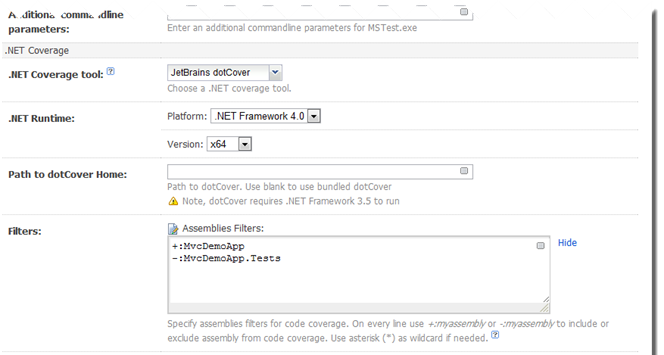 This entry was posted in How-To's and tagged dotCover, TeamCity, unit testing. Bookmark the permalink. 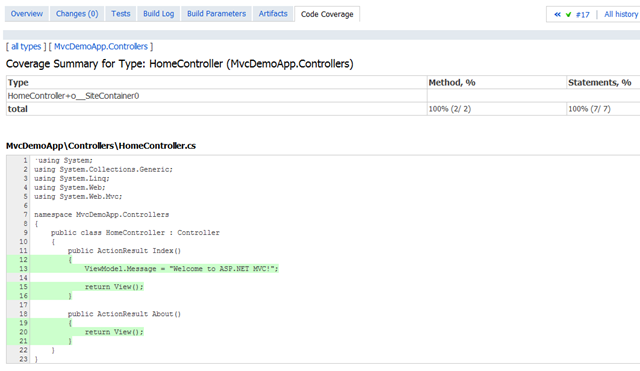 I’ve configured my TeamCity Pro installation as above and although the coverage summary does show up on the overview page for each build no Code Coverage tab exists. Is there something specific I need to do to create this tab? Thank you very much for adding the possibility to measure coverage, running tests through msbuild as well (the alternative runners section). Personally I prefer running the tests through msbuild, rather than configuring this as a test task in TeamCity. This way I’m able to recreate the complete build script locally. This is possible with the example above. Can you look at the Build Log, All Messages? Can you send it to me? (hadi at jetbrains dot com). Is there a way to use DotConver TeamCity integration with multiple test runners at once in the same project (e.g. MSpec and NUnit)? I could create two different projects, but then my coverage results won’t be realistic because they are not merged. TeamCity will merge the reports using dotCover’s merge functionality. In your dotcover.xml mspec example the paths for and are absolute. Is that deliberate? Are relative paths supported? Did you have to do any post installation to get MSTest 10 to work? I just installed TeamCity 6 and when I add a build step for MSTest with the default MSTest 10 directory specified as you have above I get an agent error stating that MSTest does not exist. No, didn’t have to do anything else. Does it work if you add MSTest to the path on the build agent? You should be able to . 1) dotcover.exe does not end up in the path of the agent automatically and there does not seem to be a TeamCity variable that contains the full path. 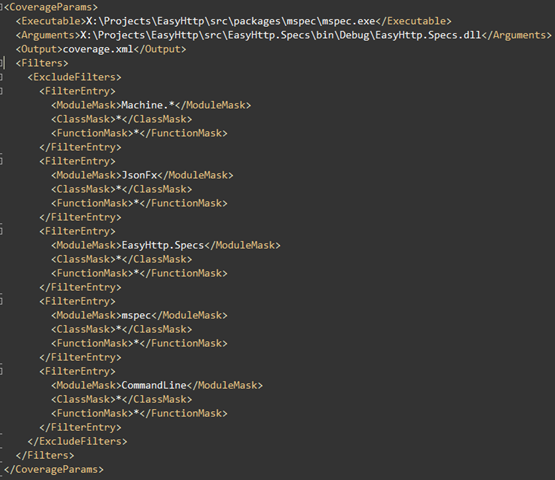 Note that this all assumes you want to put the dotcover.xml in the root of your project folder as I did. Sorry, I should have pointed that out as you said. I had dotCover in the path. Regarding the relative paths, also. It was an issue in dotCover 1.0 and is now resolved for 1.1 (in beta), and TeamCity 6.5 (in EAP) ships with 1.1, so that should be solved. 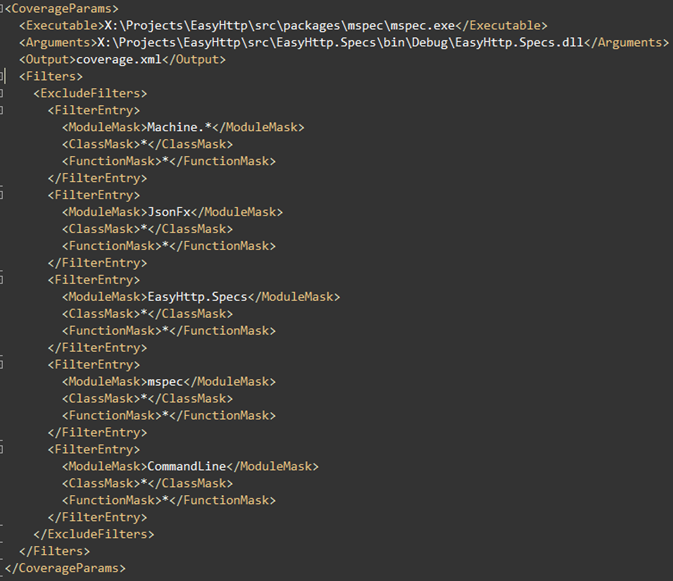 In fact 6.5 ships with MSpec support so most of this is now redundant. My apologies though on not making those points clear. I believe that the stable version of 6.5 is planned to be released at the end of this month beginning of next month. Is that still the case? Also, how easy will it be to update from 6.5EAP to the stable version? It should be a smooth upgrade. I have many build steps in my project, each running unit tests of a different DLL. I have configured DotCover for all of them. But it looks like the results displayed are only for the last build step. When I removed DotCover from the last step and ran my project again, I saw the coverage result for the one before last build step. How can the results be merged? (we expect this to be fixed in 2.5). As a workaround, you can use less strict filters in every build step. 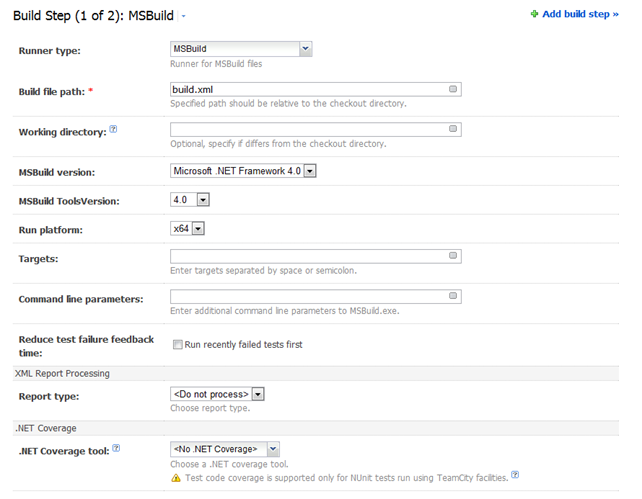 Another option is to revert to using just one build step which runs unit tests for specified assemblies. This can be done using wildcards or by adding multiple entries to the include or exclude assemblies list in the build step. For example, to include all assemblies in the “sources” folder which end in .Tests.dll and are in the “bin” folder, you can specify “Sources**bin***.Tests.dll”. Excluding can be done as well using the same approach. Thanks! I changed the filters and got all the coverage results. I have another question: can I run coverage on a regular console application. I have unit tests that run as a simple console application (actually as nunit console-runner). I configured them to run as a MSBuild step and checked the dotCover option. The tests ran successfully but I didn’t get any coverage results. Is there any documentation on how to have DotCover + TypeMock + NUnit working properly on TeamCity? Thank you very much. 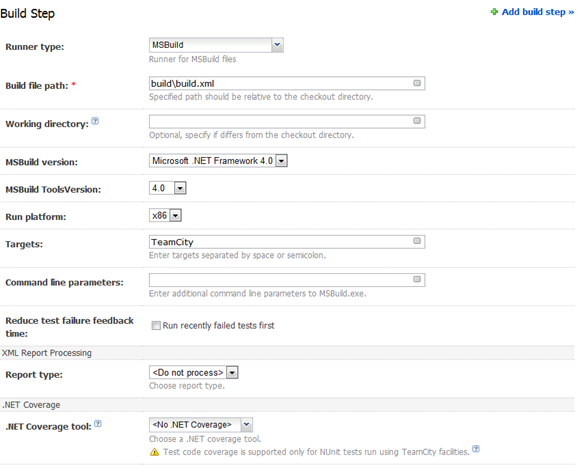 This article helped a lot in configuring TeamCity code coverage. Is there any documentation on how to have DotCover + NUnit 3.4 working properly on TeamCity 9.0?